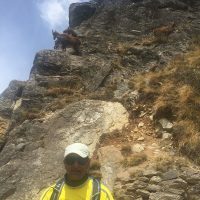 A few weeks back, our Managing Director Mithra, completed a challenge of a lifetime: to be the first person to climb to Mt. 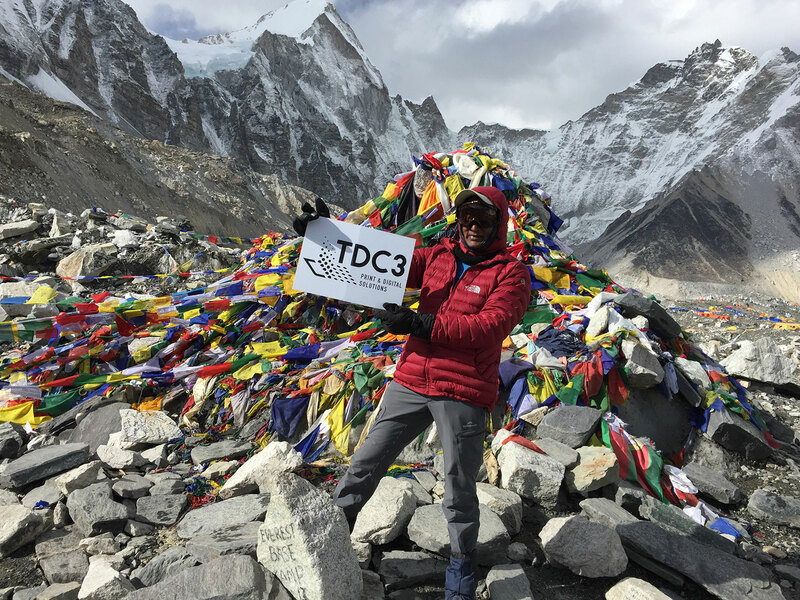 Everest’s base camp with a TDC3 sign in tow! Read on to find out more about his journey. 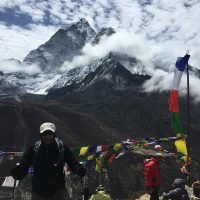 Mithra got the idea to climb Everest Base Camp (EBC) two years back after his 4-wheel drive trip to Alice Springs through the Flinders Ranges, Parachilna, Oodnadatta, Uluru and MacDonnell ranges- where he climbed St Mary peak at 1171 meters. 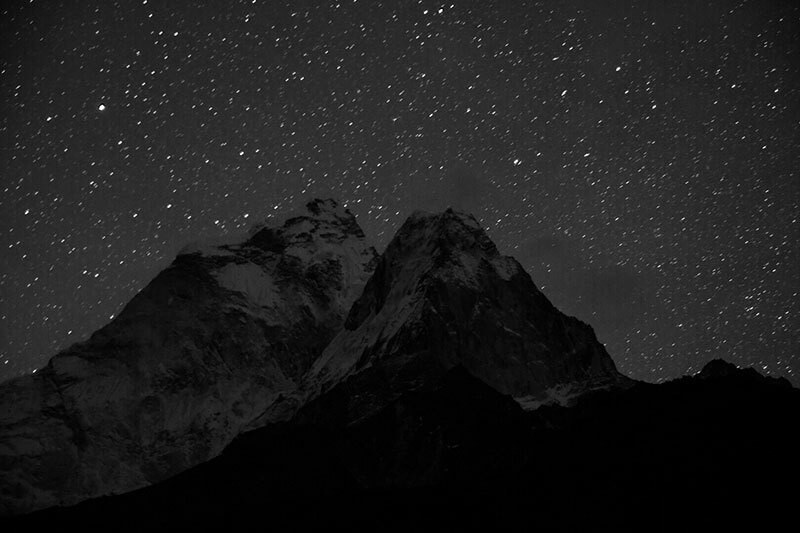 Since then, he had spoken with many of his friends to see if they were interested in joining him to trek EBC. The initial enthusiasm some displayed at first evaporated when it got near the time of the journey. 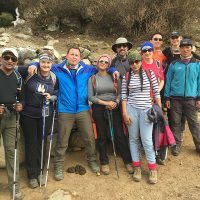 However, after contacting a trekking company in Katmandu, Mithra was put with a group of 8 people from the United Kingdom. 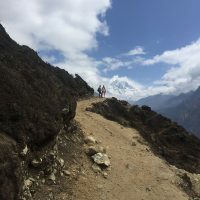 In preparation, about 3 months before the Trek, Mithra started his training by climbing the thousand steps, doing the Lysterfield trail and swimming 30 to 35 laps, twice a week. 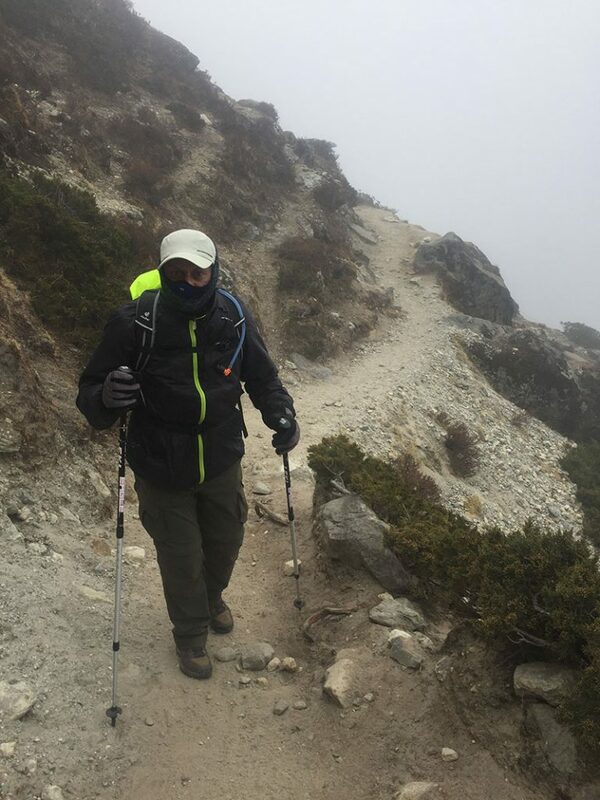 All the necessary gear and clothing to withstand the cold, wind, rain and snow was purchased over the few months leading up to the Trek. Reaching the beginning of this journey was a perilous mission in itself! 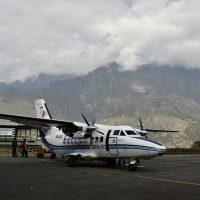 To get there, one must take a small 10-seater aircraft to Lukla Airport, known as the world’s most dangerous landing strip. 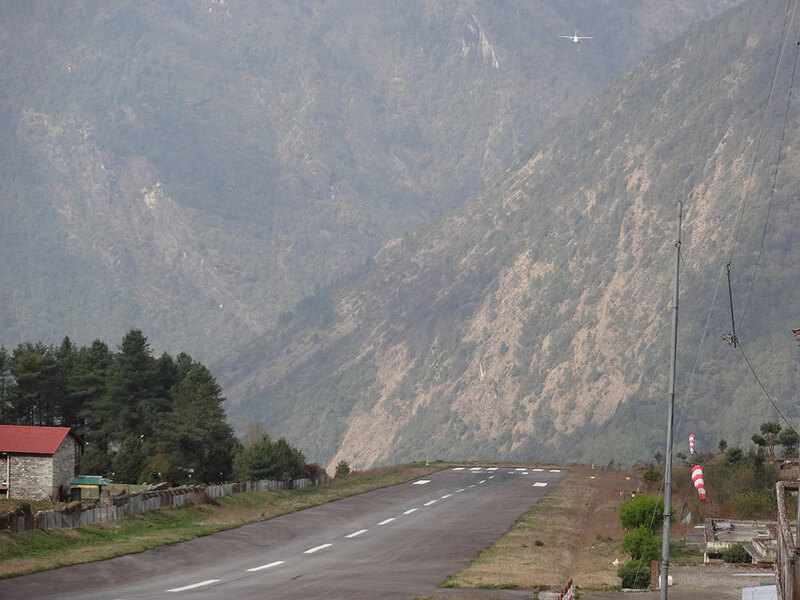 This “airport” has no control tower, radar or navigation; all landings are done by eye on a runway that slopes upward. Flights are only possible before midday in clear weather. 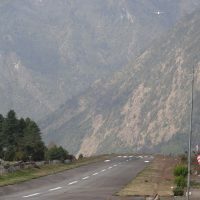 Often, even on sunny days in Kathmandu, one will find that Lukla airstrip, situated on the side of a mountain, suffers from either cloud cover, high winds or sudden downpours. 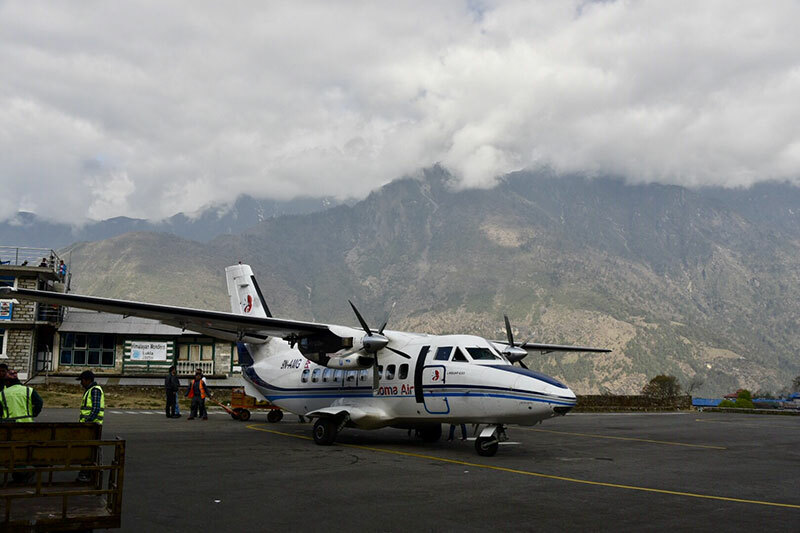 Luck smiled on Mithra, blessing him with clear skies and a relatively smooth flight from Kathmandu to Lukla. Thus began the arduous trek to EBC. 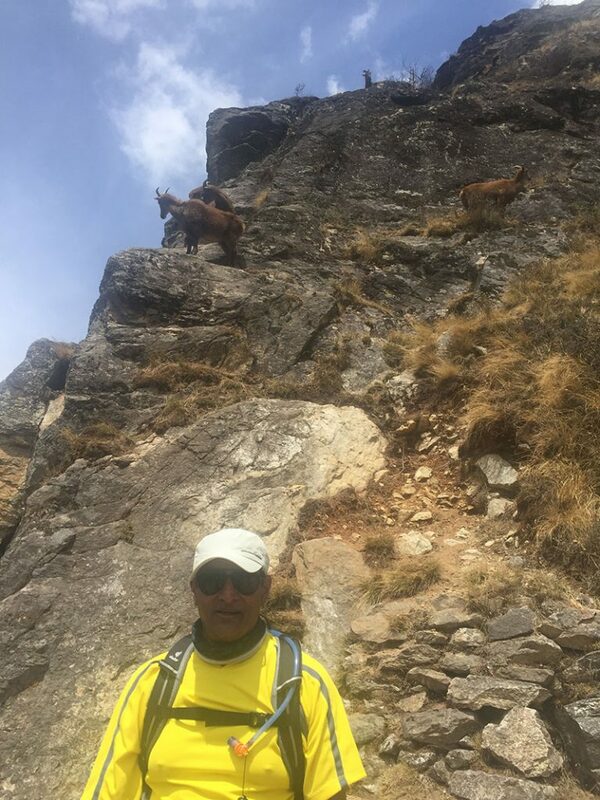 Narayan, the local guide who had already led 16 other groups over the last 6 years, led the group of nine up to EBC. A punishing eight days up and a long, hard four days back down. 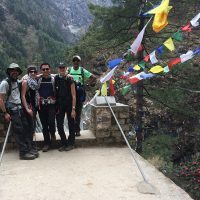 Not all members from Mithra’s group of climbers did succeed, but everyone made outstanding efforts to get as far as they did. All this climbing over the years has taken a toll on the guide. 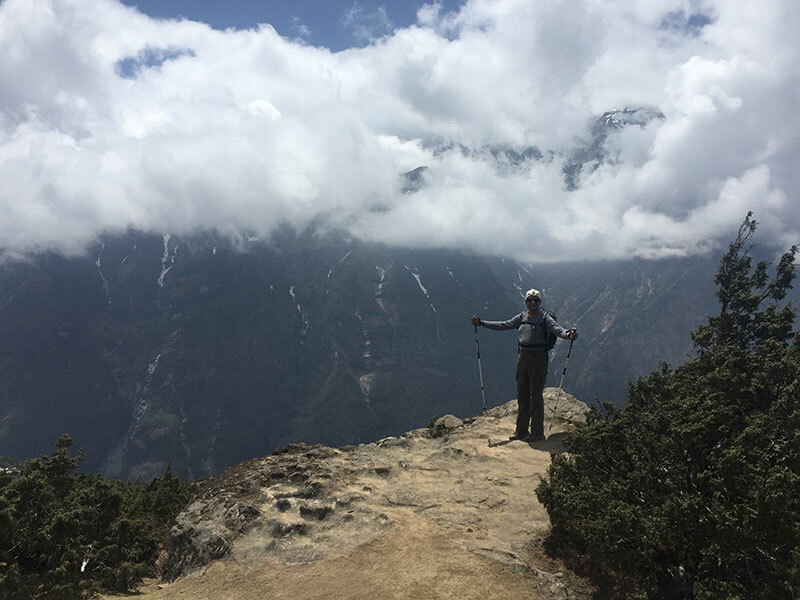 Narayan himself is not sure how many more times he will make it to EBC as many other guides like him have succumbed to exhaustion and organ failure after multiple missions to EBC, bringing their careers as guides to an end. 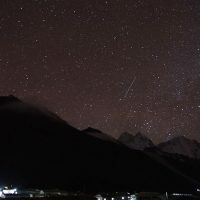 In Mithra’s backpack was a 3 litre water tank with a tube that ended near his mouth for ease of drinking, two pairs of gloves, long sleeved warm t-shirt, jacket for the rain, jacket for the cold, mask, goggles, beanie, pants for the rain, trekking poles, heat crystals, first-aid and medical supplies, scarf, and a supply of chocolates and nuts. All this weighed 12kg and the only other bag, carried by a porter, totaled 15kg and housed the TDC3 Print and Digital Solutions corflute sign. 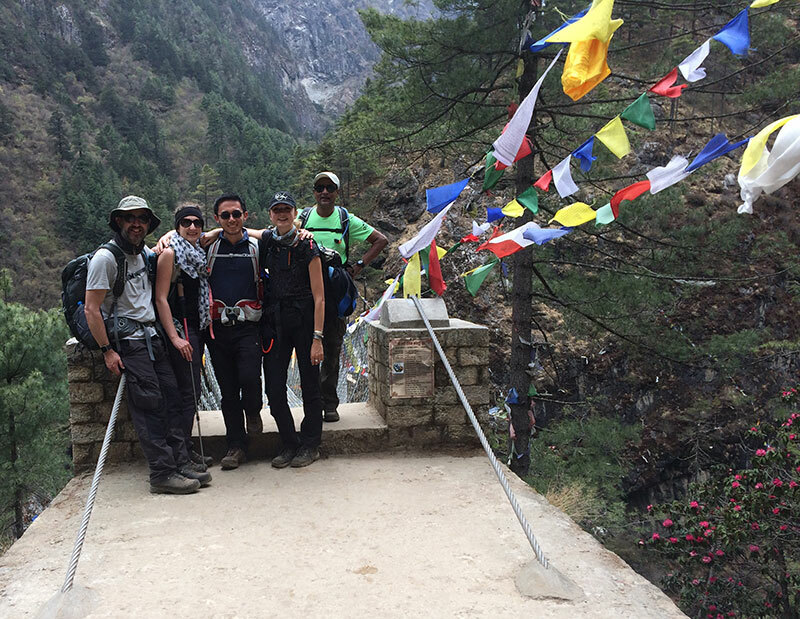 Every day, the group hiked for 10-15 hours, starting after an early breakfast, with a brief pause for lunch. All meals were essentially vegetarian—rice or noodles with vegetables and eggs—as the locals do not eat meat. 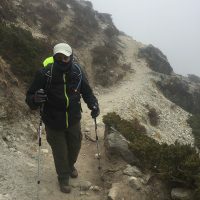 Fresh meat was a scarcity as it had to be transported from Kathmandu to Lukla and then on the back of a pack animal with no refrigeration – rendering it questionable for consumption. 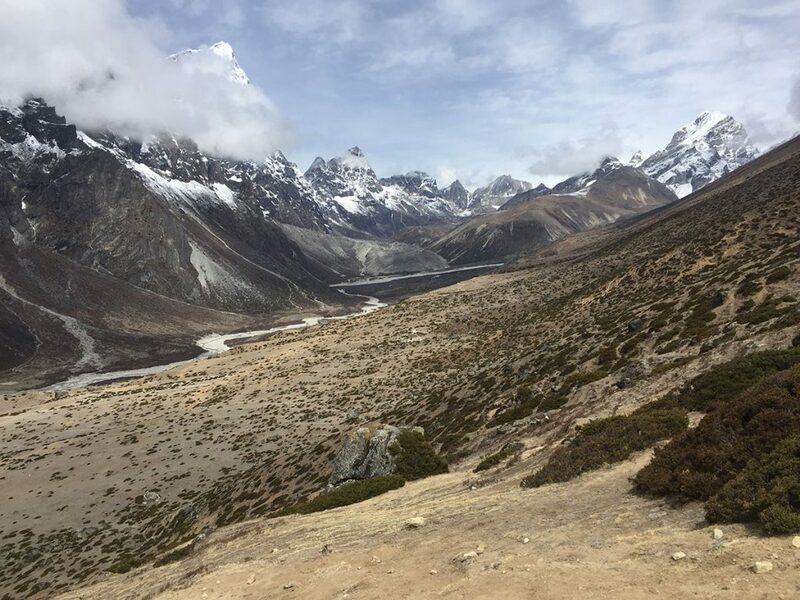 On this trek, one would see trees, flowers and other vegetation up to about 3800m on an ever-changing landscape. As one ascends higher trees are replaced by shrubs and the shrubs get smaller too. Then they disappear altogether to be replaced by rock and ice. Breathing gets more challenging and the blood oxygen levels drops from a normal value of 100-90% to about 80%. It keeps dropping off further as one goes higher. 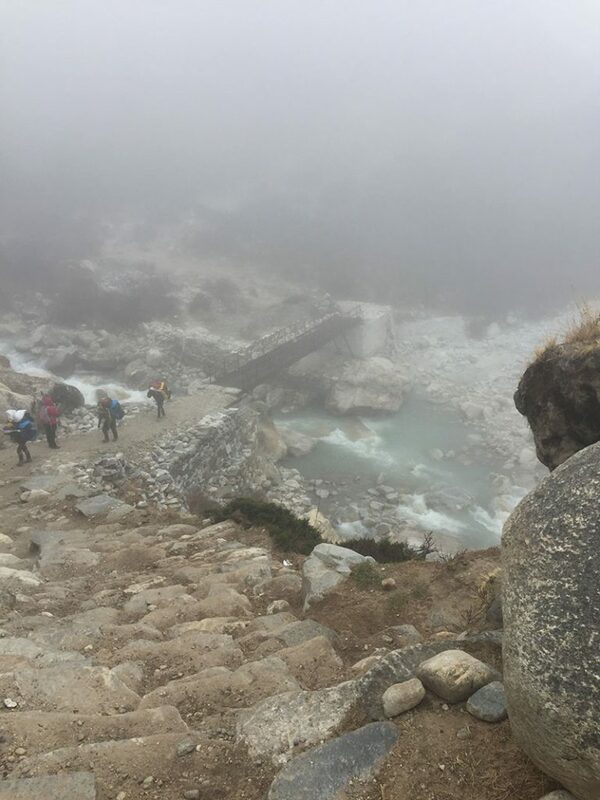 After climbing above 3,800m every step has to be placed with utmost care as the path is unpredictable with rocks, pebbles, uneven ground, ice or crevices. Every step is different to the one before. 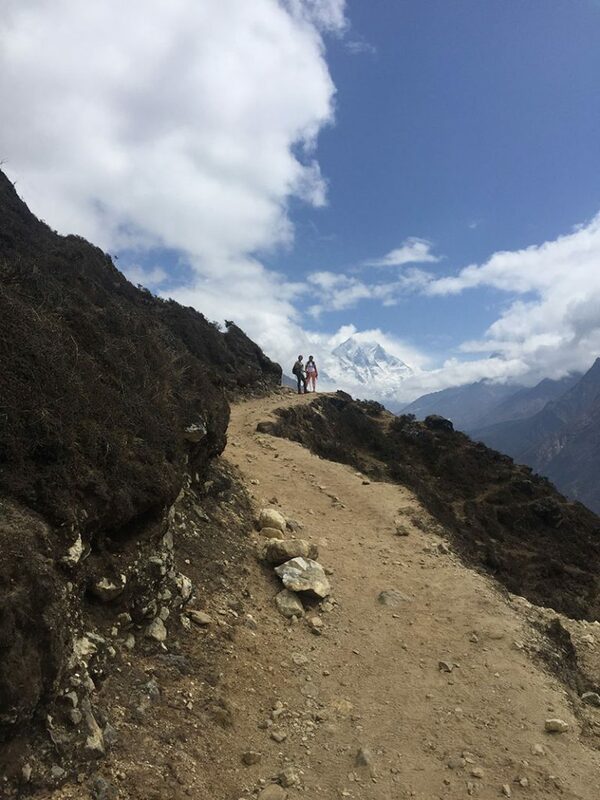 Often one would climb 600m then climb back down 500m and then back up 700m. 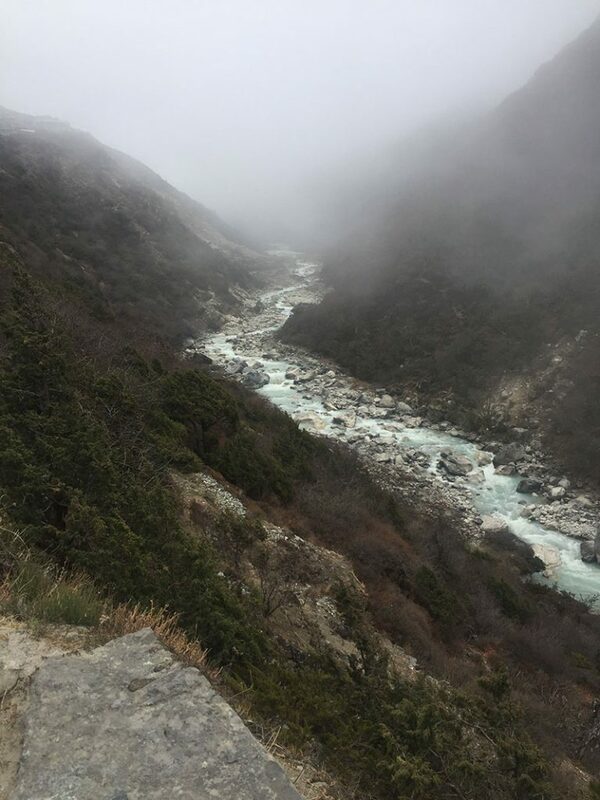 Serious concentration was essential to avoid the risk of breaking an ankle or going down a precipice. 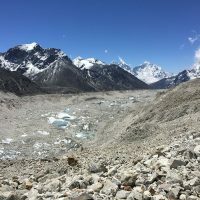 The day before Mithra’s group reached the base camp, one of their numbers had severe altitude sickness causing her to drop out of the mission. 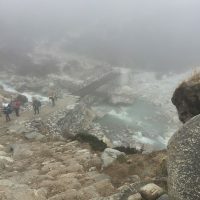 The next member was stumbling the day that they approached the base camp, and the third one fell the day after also due to giddiness and vertigo. A rescue helicopter had to be called in to transport them off to Hospital in Kathmandu. 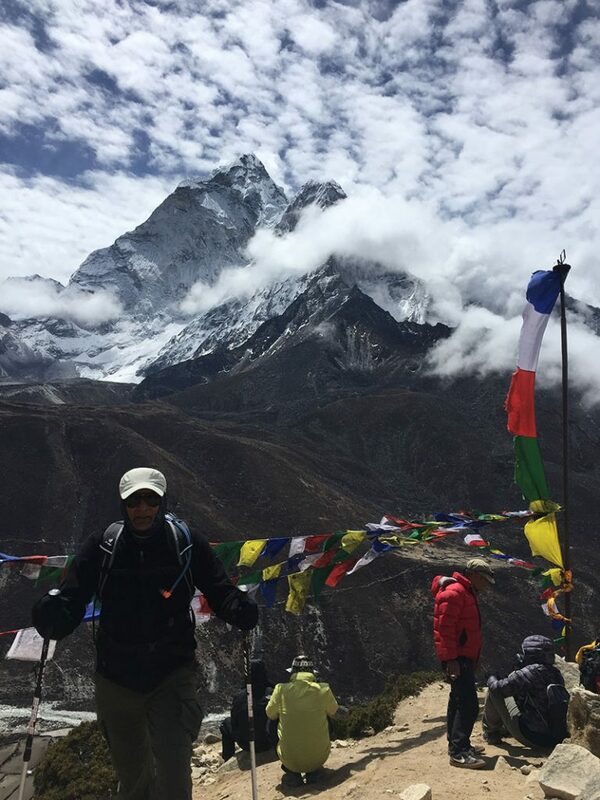 According to Mithra, the hardest day of the climb was the last day before reaching the base camp. 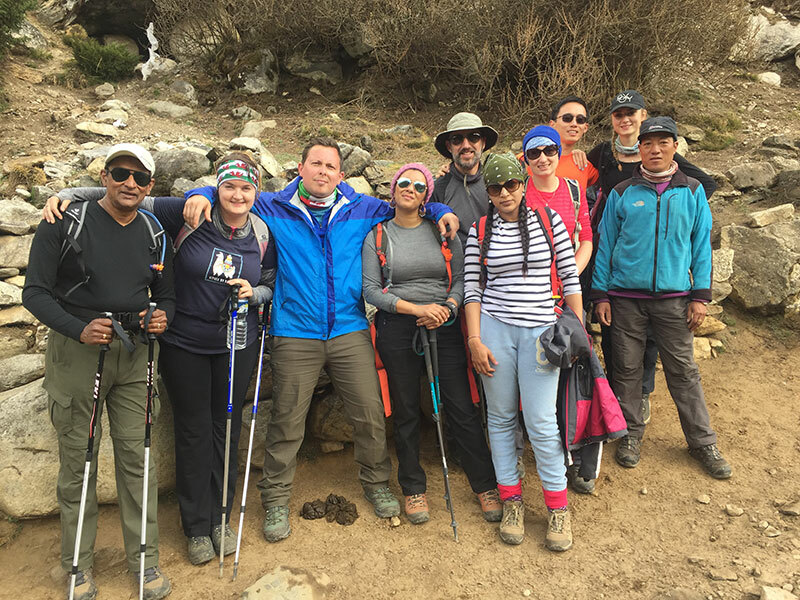 The group climbed up to 5,450m and then down again to 5,340m to finally reach their destination. 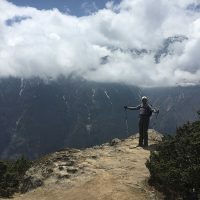 It was not straight and simple as one might think; the route wound from side to side, up and down on the world’s largest mountain range, The Himalayas. 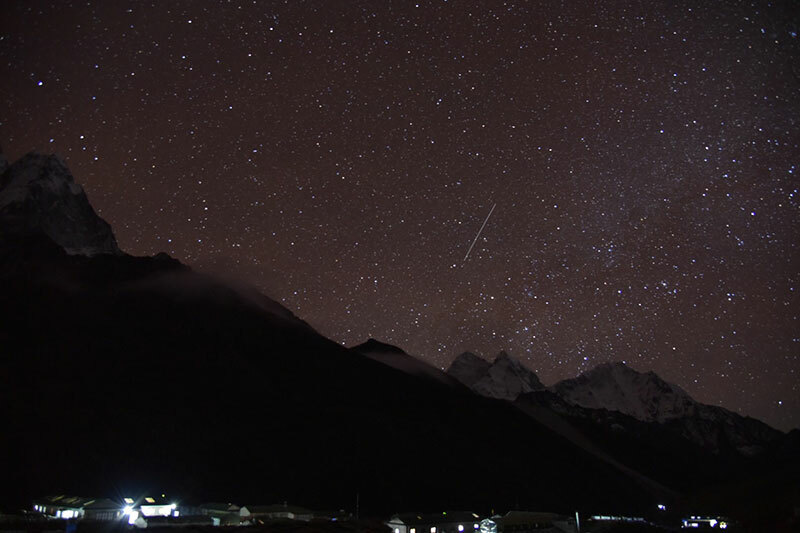 Oxygen in the air at this altitude was only 54% and the temperature was a chilling -20° Celsius. At this stage Mithra’s blood oxygen level had dropped to 43%. Below 35% would have been fatal and cause heart attacks and other organ failure. With every step, he felt the weight of a load of bricks on his back. 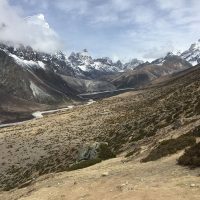 Due to the lack of oxygen and exhaustion Mithra could only take a few steps at a time. 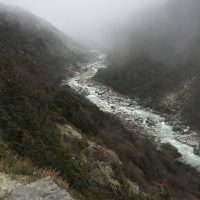 In addition to that, the nights before and after reaching the base camp were possibly the coldest nights of the journey; so cold that the simple task of changing clothes was an impossible one. There was no water, only ice. The only liquid was the water in the backpack mixed with electrolytes. 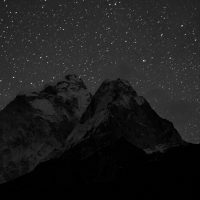 Modern science and trekking gear such as micro-fiber thermal wear, sure-grip trek shoes and crystal heat packs aided Mithra’s survival. 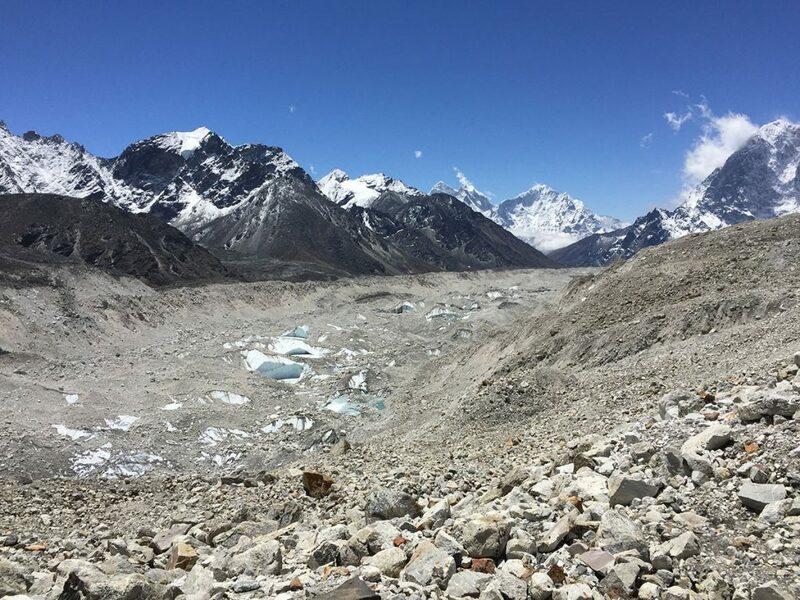 Despite all this hardship, Mithra said that he never felt like giving up; and in turn, because of all this hardship, he said that reaching Everest base camp made him feel ecstatic. Mithra had packed the vinyl print mounted on 5mm corflute in his own backpack that morning, and now pulled it out to mark his and TDC3’s incredible achievement. The sign was in pristine condition with only a crease where it had been folded for portability, proving that no matter how big the challenge nor how tall the order TDC3 Print and Digital Solutions can take it on and see it through to the end!